This is where all your misplaced holiday footwear has gone. 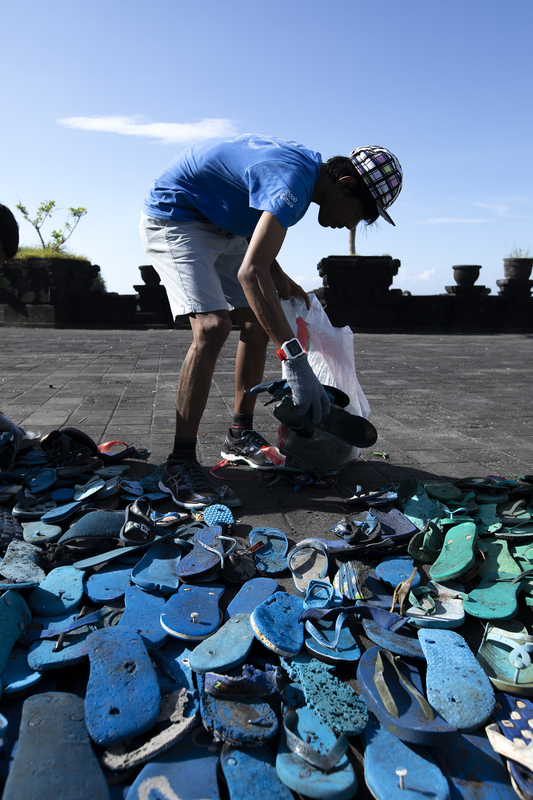 A rainbow wave of more than 5,000 discarded thongs (you may know them as flip-flops) is on display in Seminyak, a beachside area in Bali, Indonesia. The piece, titled 5,000 Lost Soles, was conceptualised and executed by German-born artist Liina Klauss, who rallied about 100 locals to collect thongs from beaches and build the art installation. The thongs were collected from three beaches on the west coast of the popular tourist island. Klauss' volunteers made six trips to the beaches to collect the discarded thongs. She called those trips "sole searching", and she was struck by how many things they were able to collect in such a short time. The first cleanup occurred in February 2017 with the help of children from Green School Bali. Over 2,000 thongs were collected. From March to May this year another 3,000 thongs were collected along a 3km stretch of beach. The project reminded Klauss and the volunteers of the real damage our habits have on the oceans. "Shoes are closer to our bodies than, say, a water bottle," Klauss told BuzzFeed. "They are worn directly on the body and for a longer period of time. 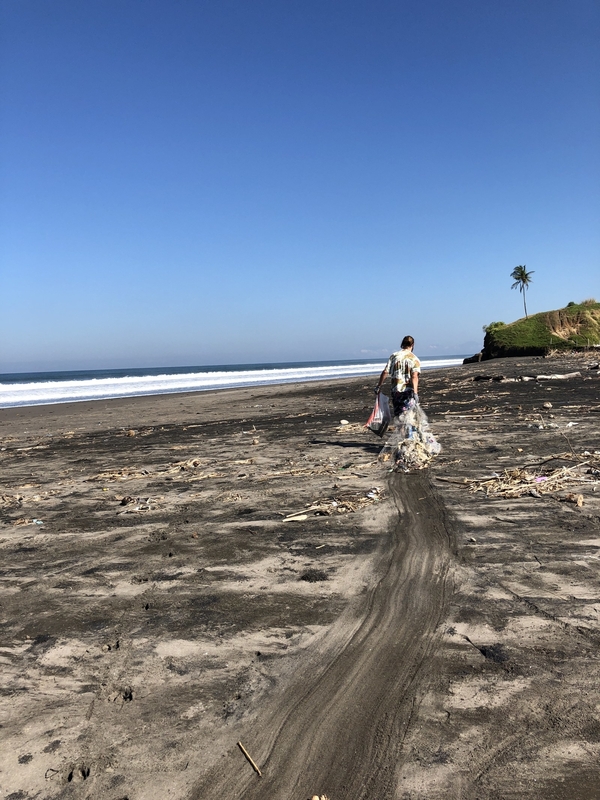 It is crucial to my art that people make a direct connection between marine pollution and their own daily lives." All the thongs were collected from the ocean or from nearby surrounds. "To get people out of their urban environment is a big part of my art," Klauss said. "For two to three hours, participants get out into the wild and see, feel and touch marine pollution first hand. The impact of this experience is much stronger than only reading about it." The rainbow colour scheme in Klauss' installation was created naturally, without having to paint over the collected footwear. "The entire colour palette came from the beach. Flip-flops are colourful and make a great palette. So the colours are used in exactly the way they were found, and we simply sorted them and brought them into order. There are tons and tons of materials waiting for our creativity." It's not the first time Klauss created an art piece with an environmental message, but this Bali installation is the biggest so far. "I remember being interested in things that were left over since I was a little girl. When I was in Hong Kong I noticed the excessive amount of flip-flops on ... beaches. The sheer volume of abandoned shoes mirrored our over-production and over-consumption. "I believe the concept of what we call ‘waste’ is outdated. Nothing is wasted until we waste it. Do we have the capacity to see the potential within all materials we waste and consider worthless?" Klauss said her "Lost Soles" series is site-specific. The materials are collected locally and won't be travelling to other locations. "It's all about finding local polluted beaches. The idea for 5,000 Lost Soles originated in Hong Kong where where 1000 Lost Soles was exhibited in 2015. My goal is to have an installation with 10,000 lost shoes, wherever that may be."